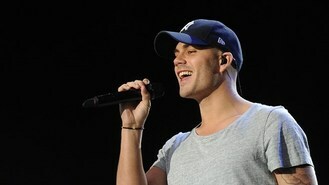 The Wanted singer said his collaboration with the US rapper earlier this year was part of his own solo project. It follows his bandmate Nathan Sykes, who recorded a duet - Almost Is Never Enough - with girlfriend Ariana Grande. "We're doing little bits here and there and I recorded a song in America a couple of months ago with another artist. I actually did a song with Flo Rida - the rap in it is hilarious," he told Capital FM. The 25-year-old admitted he is in the dark over the final cut of the track, adding: "I've not actually heard it since I went in and did it." Max teased that The Wanted, whose new album Word Of Mouth is out now, may go their separate ways after their 2014 world tour. "We've got our first world tour coming up, so let's do that and let's split up at the end of that," he joked.